Features a gold tone case, black leather strap and quartz movement with date, against a white mother of pearl dial. Bought as a present for my wife. She loved it, finds it comfortable and loves the classy look. Ladies watch at the right size and price. Delivery was excellent and quick. Great watch. Made a perfect present. 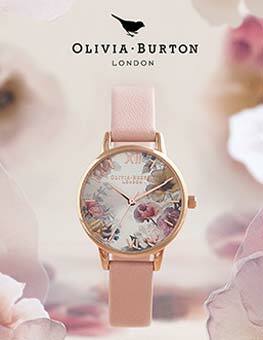 Beautiful watch, with elegant detailing on the strap and fastening. The mother of pearl face catches the light well too! Stunning and excellent quality. Was looking for an everyday watch and chose this one for five main reasons its a Rotary, its the right size face for me, real leather strap, no fancy details and the price. As an added bonus, the watch is particularly attractive with the gilt finish, easy to read Roman numerals and the clockface has a very attractive pearlescence, the beautiful colours of which are picked up in the light. The only downside is that I had to work out for myself how to set the date you need to pull the side pin out - twice to set the time, push back to a first position and turn anti-clockwise to set the date!. On the whole, I am very very pleased with the item and wear it everyday. I love the watch it was bought by my gran for my 17th birthday. It is a classic style and timeless.It fits a petite wrist and the face is just the right size. Lovely watch, very neat and stylish. Bought this for a present and cant wait to give it to my friend. Elegant watch, beautiful pearl face, delicate detail and good quality leather strap. A beautiful, classic style. A timeless piece, with great value for money. Soft leather strap and elegant face. A perfect fit for a slim wrist, that fits comfortably neither too baggy or too tight. The dial is easy to understand when setting the time and date. Delivered in a lovely box complete with care instructions. Cant find any negative points or anything that I would change. Would recommend to a female of any age. the watch i received was beautiful and perfect for a 40th birthday present as it was intended. the intended recipient is allergic to cheap metals so the gold face and leather strap were ideal. 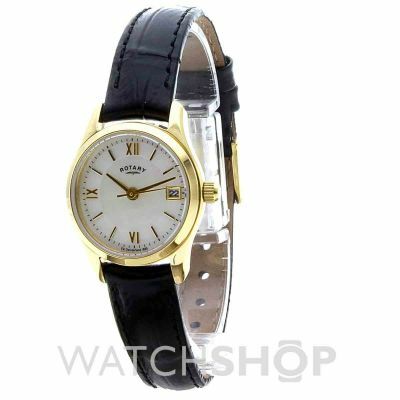 The rotary watch is a lovely example, gold with a black leather strap and a pearl face. Its a very smart watch - not too big and not too small. Would recommend buying this watch especially as a gift for someone! I purchased the Ladies Rotary watch as a birthday gift for my wife. I was looking for something for informal and formal use, refined and timeless in design. I got it in this watch. The gold casing, pearlescent face with the delicate numbering and black strap work great together. It is easy to read although the date is a touch small. One minor thing, it can be a little awkward if you need to change the date until you get use to it but once set all is ok. According to my wife the watch is very comfortable to wear. All in all a lovely watch. My wife is delighted with it. I bought this rotary watch for my girlfriends birthday and have to say I am very fond of it. My girlfriend asked for a classic watch, that was clean faces whilst being able to fit her unusually small wrists. This watch fits all that criteria and more. The clean face allows for a classic uncomplicated look, however with the pearlescent backing allows for a slightly different complexion in all lights. The gold casing against the black leather lets it look very classy whilst being not too posh for every day wear. Honestly, there is nothing I dislike about this item, and that for once includes the price! Bought this for my wife for Christmas. Nice watch but I was surprised to see that the face was pearlescent and not quite as modern looking as I wanted, more classic for an older person I think. On opening the box there was a lovely smell of leather from the strap. The face is beautifully clear and the mother of pearl gives it an expensive look. Simple and elegant in design, this will be a great 24/7 watch...really wearable. A lovely watch delivered very promptly. The buying process was simple and I found the images and vidoes on the site particularly helpful. 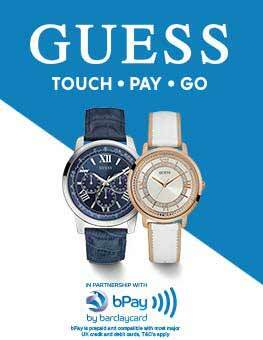 A very smooth, easy and pleasing way to purchase a watch. This is a present for my wife. I bought it gift wrapped as men are useless at wrapping presents. The price was very competitive for a small ladies Rotary watch with roman numerals and date window. It is even gold plated which is good for the price. I know she will be surprised and pleased. Classic style watch that can be worn from day to night. 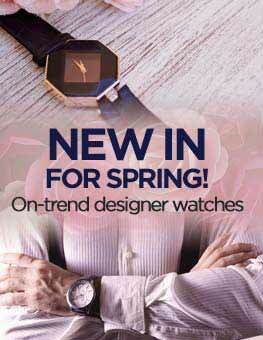 Excellent, preety and comfortable watch that can be worn all day. An excellent watch purchased as a Birthday present for my daughter. The watch face is easy to read and is elegant in design. This watch was a birthday present for my mom. It was nicer than it looked online. The service was 2nd to none,i ordered late on a Friday night,and the postman was knocking the door with it at 7am Monday morning. 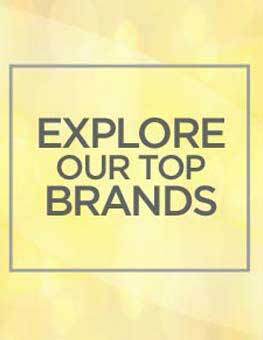 The best online shopping store i have used. So far so good. Looks great, fits well, is light and is the small size I was looking for. Product arrived in perfect condition and working order. Tells the time important to some. Really like the black and gold colouring and and classic look. great for people with wrists. I love Rotary watches. I have five. They never fail to please. Great quality, style and within normal folks budget! This one is great. I bought it as an every day watch but its stylish enough to wear for evening too. Nice fit and clear face. One happy bunny! I ordered the Ladies Rotary Watch for myself as an early Christmas present from my partner, as I unfortunately lost mine on a train journey. It is pretty much a replica of the one I had which was 13 years old although it maybe has a slightly larger face. The mother of pearl face is very attractive. The overall design is classic and ideal for my small wrists. So far the watch has kept excellent time and I am very pleased with it. Bought as a gift, really pleased with the quality. A nice leather strap a slightly large face than most watches I looked at. Really loved the mother of pearl dial. Great watch, really looks fantastic, and is a classic so wont fall out of fashion. The mother of pearl face is nice and subtle while still providing something slightly different. This is the second purchase from this website, and once again received a great service, and fast delivery! My partner really loves her new watch. I went through a lot of the watches on site and read a lot of reviews before deciding on this particular watch. The pearlescent face is very pretty. and it looks classic. Bought a lovely ladies Rotary watch. Unfortunately it has been losing time, roughly 5-6 mins every day. Didn't really want to send it back, but don't want to spend money taking it to a repairer when it's brand new! Keep hoping it will be ok next time I check it, but not so far. Love this watch, brought it as a treat for myself and was very pleased. the watch is very lady llike and fits my skinny wrists well. the face is clear and easy to read! all in all great watch!! I loved this item, nice size,delicate the way I wanted it, colour is lovely and the face is nice I keep this for special when I am off work. well worth the money and highly recommend this seller, also note the postage was fast. I was given this watch as a Christmas present. I like the mother-of-pearl face on the watch and the fact that it is not too big a face because I have quite small wrists. It is also good that the watch has a second hand and shows the date. The watch strap is leather and at present is a little stiff when doing it up - I expect it will loosen up as I wear it more. The watch itself is approx 2/3 the size that it looks online, especially the width of the strap. Also, this was a replacement for a Rotary leather strap waterproof watch that I lost last week so I chose very carefully for an almost like for like replacement. Disappointingly, I can only do the strap up on the very last hole, which then feels very insecure on and, because the strap is narrower, it doesn't feel anywhere as near as comfortable as my old Rotary. NB: No critisism of the Watchshop.com who's service was excellent. 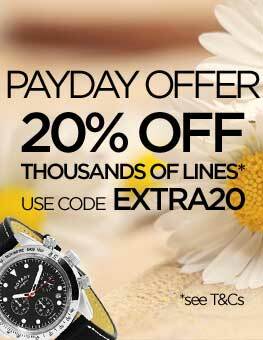 Very pleasant and fast transaction,the rotary brand name is synonomous with quality,add to that add the quality of Watch Shop Uks excellent sales and support then you really cannot go wrong at these prices. The service has been excellent - I am delighted with my purchase and the speed of delivery. The only constructive feedback I can give is that immediately after my purchase I received 3 emails - 2 were identical confirming that my order had been purchased and another to say that my 'enquiry' had been received (which was slightly confusing). I think one confirming my order would have been sufficient. I am delighted with my Rotary watch which I ordered last Sunday and which arrived Tuesday morning. Imagine my surprise when I found a bottle of Burberry perfume. Thankyou very much. Excellent service. Watch arrived 3 days after order was made. Very good value for money. Would highly recommend this company.